Senator Barack Obama holds a commanding lead over Senator John McCain – 10,238 votes (55 percent) to 8,411 votes (45 percent), as of October 21 — in The Flying Saucer Draught Emporium’s 2008 Presidential Election Poll. The Texas-based restaurant chain kicked off its poll in early September, and polling lasts until election night, Tuesday, Nov. 4. 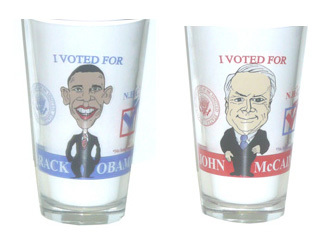 Customers can “vote” for their favorite candidate by purchasing special pint glasses for $5. Votes are tallied and updated at the end of each day, and customers can vote as many times as they like. The Flying Saucer is hosting the 2008 poll at all of its 13 locations in six states, which include Dallas, Austin, Fort Worth, Houston and San Antonio, Texas; Kansas City, Mo. ; Little Rock, Ark. ; Cordova, Memphis and Nashville, Tenn.; Charlotte and Raleigh, N.C.; and Columbia, S.C. Polling data for each location is listed, and appears to updated daily, along with a running total. The Flying Saucer’s first poll, held in 2004, accurately predicted that incumbent president George W. Bush would defeat Senator John Kerry. For up-to-date poll results on this year’s polling, visit Flying Saucer’s website.